Legal eagles taking flight to other industries is not a new phenomenon, but the attrition seems to be on the rise in recent years. In 2014, in his speech to mark the opening of the legal year as thenpresident of the Law Society of Singapore, Mr Lok Vi Ming says that by the first decade of practice, three out of four lawyers here would have opted to leave. Summing up the state of affairs in the legal industry, he says that practising lawyers in the middle of their careers - those with seven to 12 years of experience - are a dwindling population. While he did not give a firm reason why these mid-career people choose to leave the fold, he says: "Whatever the reason, we want to do what we can to stem the exodus of lawyers from this vulnerable segment of our profession." Every year, 7 per cent of lawyers do not renew their practising certificates, according to figures from the Law Society. But it does not think this is a huge cause for alarm. A spokesman says: "Law requires analytical rigour, language ability and an understanding of this world which we live in. That is why there have been and will always be lawyers who leave legal practice to contribute to our society in academia, the arts, business, charity and political leadership." Despite the fat pay cheques and prestige of the profession, many lawyers who opted out say the demanding hours and lack of ownership over their work in their early years left them jaded. Others complain that the diversity of issues and subjects that drew them to the study of law as students is lost in the repetitive humdrum of everyday practice. That is why they are striking out in other industries and establishing new careers. These success stories do not surprise Associate Professor Eleanor Wong, vice-dean of student affairs at the National University of Singapore law faculty, in the least. When asked what makes law students do well in different industries, Prof Wong, who is herself a successful playwright, says: "Students who are interested in the study of law tend to have a larger interest in the world as it operates today. Whether it's business, international politics or the way family relationships operate - each of these wide ranging issues has an application in the practice of law. "It's why a legal education not only satisfies different interests, but also allows students to go on to explore many different facets of work." Many former lawyers say their solid training in law stands in good stead in other sectors. TheatreWorks' Ong, 52, when asked what he took away from his four years as a student at the National University of Singapore law school, says: "The study of equitability, inclusivity and justice shaped my world view and framed my relationship with the arts and theatre. But more than that, getting to run the Law Review while at NUS also gave me my first foray into running my own ship and organising events - something I continue to hone in my work today." And for chief executive of Coterie Dining Concepts, Ms Tay, 37, who founded the now-defunct nightclub Butter Factory, her legal training allows her to be her own in-house counsel. "My legal education and work experience gave me a basis to intimately understand the frameworks in which businesses operate. For a new entrepreneur, what could be more helpful?" she says. And though she admits that the thought of going back into practice is unforeseeable at this point, she is quick to add that she has no regrets about the time she spent as a lawyer. "Experience in the industry just gives lawyers that extra bit of grit and determination that they need to keep going. That's probably why so many find success in whatever they do, even when they are miles away from a law firm." Three years into working as a corporate lawyer, Mr Esmond Yue began to realise that the work he was doing was making him feel like a square peg in a round hole. The University of Nottingham law graduate had spent four years doing corporate banking in firms Allen & Gledhill and Norton Rose Fulbright before quitting. "I enjoyed the rigour of law school and had wonderful colleagues and bosses, but three years in, I began to realise I wanted a different kind of challenge," the 31-year-old bachelor recalls. "Instead of becoming a specialist in a niche field at such a young age, what I wanted was a career that would offer me more varied experiences - like the numerous moving parts involved in managing a business." With his heart set on becoming an entrepreneur, he scoped out the scene and decided to act on his love for Japanese food - investing $280,000 of his savings into starting sushi restaurant Chikuwa Tei in Mohamed Sultan Road in the middle of 2012. He felt that food and beverage had "the lowest barriers to entry for a newcomer". For 11/2 years after opening Chikuwa Tei, he worked two jobs - being a full-time lawyer on weekdays and managing his restaurant on weekends. His brother Alvinn, 32, a chef trained in Japan, heads operations and helped craft the menu. Eventually exhausted by double-hatting, Mr Yue quit his $10,000-a-month law career in January 2014. At first, his parents were not happy. Both entrepreneurs themselves - his mother is a retired hairstylist and his father runs an entertainment business - they know first-hand how hard it is to start and grow a business. But they eventually came round when they saw how committed he was to making his eatery succeed. After quitting law, he enrolled in graduate business school Insead to get an MBA and business skills. He graduated from the year-long programme a month ago. While studying, he continued to run Chikuwa Tei, applying finance and accounting principles that he was learning in class to help manage his business more efficiently. Famous for its chirashi and sushi, the restaurant broke even in 2014. 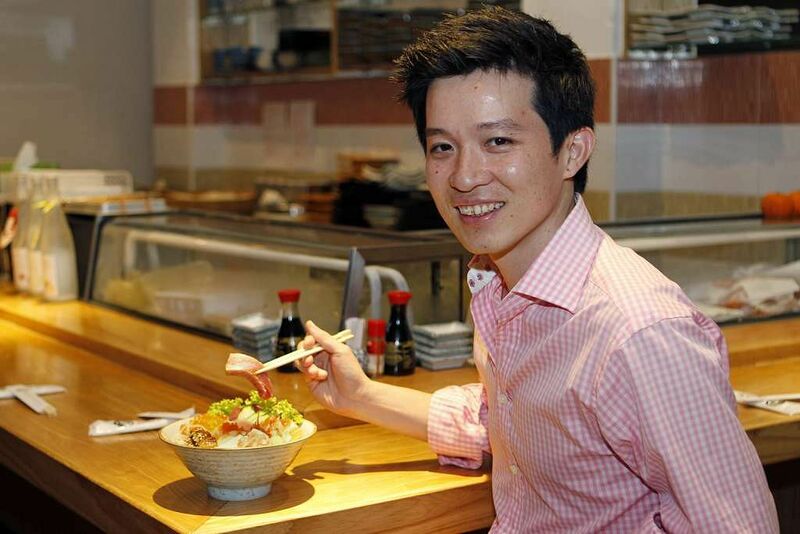 In January last year, he opened a second restaurant called Manzoku, an izakaya in Purvis Street. Also in the pipeline is a delivery option from both kitchens, which the brothers hope to launch through their website hungry ninja.com.sg, which will be up and running next month. The biggest accomplishment over the past three years has been overcoming the challenges that come with managing staff and rewarding the right people. "I have staff who have been with me since the day we started. And as someone who is looking to build a strong brand and presence in the F&B scene, their loyalty is one of my biggest accomplishments." And when it comes to his journey from legal eagle to business owner, he says he has no regrets. "Sure, I'm still missing the pay cheque every day, but running my own business puts me in touch with the workings on the ground in a way I never felt when I was handling million-dollar deals as a lawyer," he says. "You constantly have new fires to fight when managing a business but, in all honesty, that's part of the fun." Former lawyer Kendra Liew has always been comfortable wearing many hats. While studying law at the National University of Singapore, the music lover picked up deejaying and spent the next five years juggling her studies and workload with her love for spinning tracks at parties - at one point doing up to three gigs a week under her moniker ElectroKat. Still, despite her varied interests, the 28-year-old always intended to practise law full time after graduating in 2011, given how much she enjoyed her time in law school. Two-and-a-half years in as a matrimonial lawyer, working 15-hour days on emotionally taxing cases, she started to change her mind. "Even though I enjoyed the personal touch that came from working with my clients, I couldn't find an aspect of law that I felt passionate about," she says. "It made the demanding lifestyle feel unsustainable in the long run." However, the high salary she was getting and the seven years of her life she had invested in studying and practising law made the decision to leave very difficult. She contemplated several other options: being an academic, a part-time lawyer or a company's in-house lawyer. Then she realised she was "putting off the inevitable", which was to leave the practice completely. She decided to quit in September 2014 to set up a business creating organic skincare products. 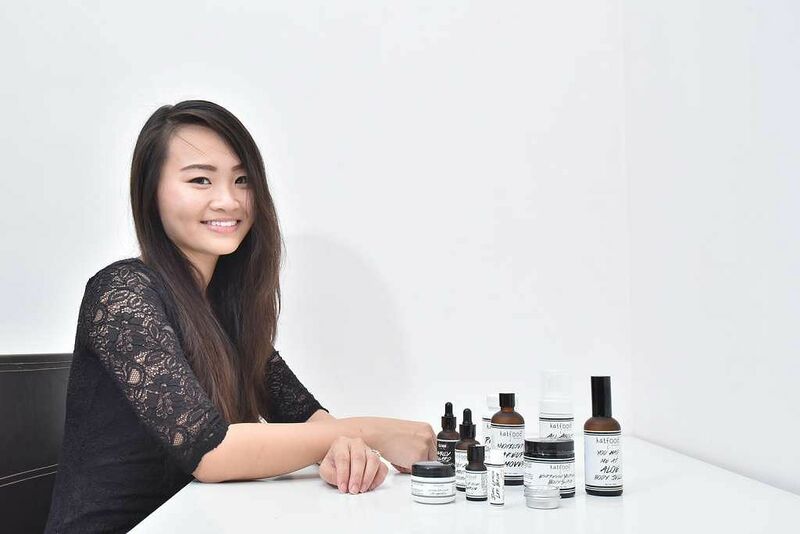 She has been concocting her own skincare since the age of 16. While considering options for life post-law, she noticed a gap in the market for natural skincare at mid-range prices. Starting in early 2014, she made an initial investment of $10,000 of her savings and spent the year creating her brand - making recipes for her products, creating contracts and setting up her website from home. Ms Liew is the older of two siblings. Her mother is a project secretary and her father is an engineer. Katfood launched in November 2014 with 10 products, including a body scrub, face serum and lip balm. The made-to-order products - which comprise natural oil and fruit ingredients, with a shelf life of three to nine months - cost between $9.90 and $36 and have stayed true to her mantra of being budget-friendly and completely natural. It was a steep learning curve for her. She had to pick up marketing and branding skills and learn to manage liabilities and cash flow. "I had to start out creating my logo on Microsoft Paint because I had no idea how to use things like Photoshop." But her time in law helped her build a thick skin and positive attitude towards hard work. Not only will she soon be expanding her range to 15 products, including a men's line, but Katfood has also been stocked by local department store Isetan and online retailer Zalora since last August. The savvy businesswoman has gone from being a one-woman show to operating the business out of an office in Tai Seng with a team of five, who help her with production, logistics and customer service. She hopes to open a brick-andmortar store and expand the brand regionally. Although she did not end up a lawyer, she says her degree has come in handy. "My time as a lawyer made me more detail-oriented and analytical - skills which have come in handy as a business owner. There are few degrees that have such far- reaching applications in real life and, for that alone, I have no regrets about my legal education." When Ms Rebecca Chiu, 29, found herself searching in vain for a good cup of Thai milk tea in Singapore, she decided to create her own drink for sale. The National University of Singapore law graduate was still working as a corporate lawyer at international firm Hogan Lovells then. Now, what had started out as her solution to an unmet craving has become Soi 55, a trendy brand of Thai iced tea and desserts. She has two outlets and a staff of 20 full- and part-timers, and has also quit her legal career to focus on her business full time. The story of Soi 55 started in early 2014, when Ms Chiu invested $15,000 of her savings in her sideline and started creating and testing recipes. In July that year, she set up the first branch of Soi 55 - a hawker stall at Golden Shoe Food Centre in Raffles Place. The middle child of three daughters says she has always been interested in the food-and- beverage industry, having worked as a waitress in several restaurants to pay her way through law school. Her parents are both retired. Moreover, she knew that "coffee and tea will always do well in the CBD". "It was also a product that I could easily control the quality of," she adds. Prices start at $2.50 for an iced milk tea. Still, nothing prepared her for the challenges that came from juggling long hours as a corporate lawyer while running her own business on the side - such as the one time a clogged drain threatened to flood her entire stall. "Imagine being at work at 6pm in your air-conditioned office and getting a call that your entire stall is being flooded," she recalls with a laugh. Thankfully, as she was rushing down to try and manage the disaster, the neighbouring stall owners were pitching in to help - moving equipment and unclogging the drain. Small crises aside, the brand took off quickly and, in under six months, began turning a profit. Reasons behind Soi 55's runaway success include its trendy branding (the stalls are designed to look like Thai push-carts) and the extensive love the business got on social media such as Instagram. Last year, Cathay Cineplexes approached her to open a branch at its Handy Road cineplex, with the added perk of allowing patrons to take her drinks into its cinemas. That was how a new branch of Soi 55 opened at the cinema in August last year. "Going for a movie and seeing people drinking my Thai tea in the cinema has been one of the biggest accomplishments," Ms Chiu says. She now sells nearly 300 cups on average at each outlet and hopes to open more branches across the island. Outside of her signature Thai milk teas, the brand also offers other Thai-inspired drinks and snacks such as a coconut milk slushie and Toasted Brioche with Kaya Dip. Still, she says she will not rule out going back to being a lawyer. "As a business owner, I've applied so many skills I'd learnt as a lawyer - everything from handling disputes to reading and crafting contracts. It's why I'm open to going back into practice again one day."